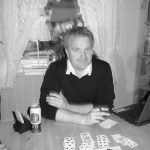 Back in 1993 Geir Helgemo was qualified with the Norwegian Open team for the first time to play the Bermuda Bowl. This was the first appearance of the great Norwegian Open Team that had its peak with the gold medal in 2007. Geir was 23 years old, and already considered the new wonder boy of bridge. The first match was against the mighty Americans, the favorites in the championships. Geir got right into the heat at the first board. He was on lead against 4♠ and showed the world what was about to come. What would be your choice as 23- year young Geir Helgemo sitting west? Remember this was his first Bermuda Bowl and the first card he had to play in the bowl! Geir showed no fear and grabbed the TEN OF DIAMONDS! Some attitude you say, you face the favorites and choose to under lead an ace! Bobby Levin didn’t have a chance to make the contract since the defense had established their diamond ruff. He won the lead in hand and played a spade to the king and ace. Tor Helness passed the test continuing with a diamond to the ace. The 2 of diamonds gave Tor his ruff. He just played a club back and the defense waited for the setting trick In ♥ or ♣. The Norwegians stopped in 3♠ making 170 in the closed room, indeed it was an important lead signed Geir Helgemo. The board was reported in the championship bulletin by Arne Hofstad.